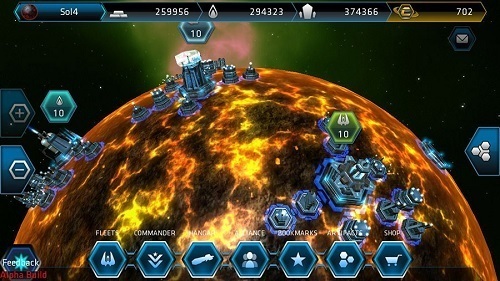 Galaxy on Fire Alliances brings the series into the world of online play with a third game which follows a MMO strategy style. Both fans and newcomers to the series will find that there is plenty of enjoyment to be had in Alliances. 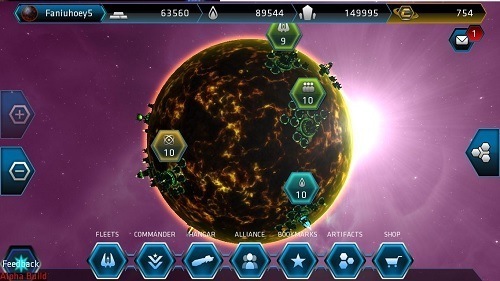 In the game players can attempt to dominate the galaxy with their own commander from one of the three main factions in the previous games (Terrans, Vossk and Nivelians). Starting from a small base of operations you’ll want to grow your army and fame in the game world which will eventually allow you to join player alliances which are a core element of the overall gameplay. Managing your alliance is very easy with a voting system that lets you vote on how your alliance should use their resources. In total the game world has nearly half a million planets each with their own visuals, stats and bonuses for players to find. The most powerful of thee bonuses are the runes that are embedded on some planet surfaces which can dramatically boost you’re speed, attack or defence of your space fleet. On each planet you’ll have a number of building hubs where you can place buildings with various uses. This can range from mineral extractors (metal, gas and crystal) to shipyards and even planetary shields to help protect you from attacks. Buildings have multiple levels which boost their effectiveness so players will need to carefully spend their limited resources. In addition to buildings players will also have to use their resources in building ships to defend yourself and attack other players. There is plenty of customisation available to players to create their own ship designs and fleet layouts so you can create something that meets the needs of the current mission and your overall strategy. Once your fleet has reached the enemy planet you won’t be getting just a simple run down of the events you will actually get to watch an impressive 3D battle report that lets you watch the ships you created flying around the screen in battle over the planet itself. Brings the Galaxy on Fire universe into the MMO space. Choose from one of three available factions. Customise your own ships and fleets. Join alliances with other players to dominate the galaxy. Impressive 3D battle reports lets you get immersed in space battles. The game creators do not take any effort to control myltiaccounters and cheaters making the game a whole loss of time.